(Continued from the previous post…)It’s not just the trees alone that are intelligent. Something that was really amusing in the forest was the large creepers. If you look at them, you can see that they go from one tree to another. 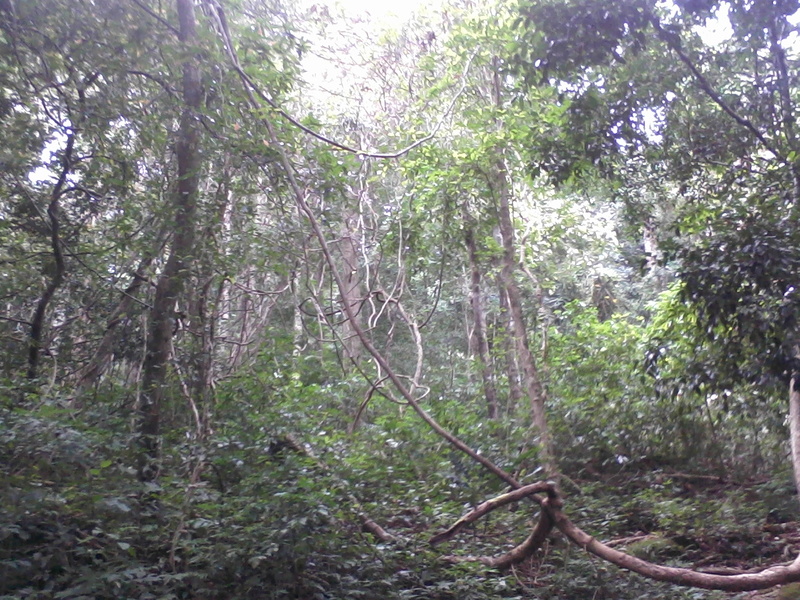 The trees are several meters apart and the creepers are several meters above the ground. One thing that amused me was how these creepers reach from one tree to another. One theory that came to my mind first was that these creepers had climbed on to the trees when the trees were pretty small, and then they grew with them. But that didn’t relay look like a prabable theory, because in most cases it would have taken several years for the creepers to reach such heights. The most important observation against this theory was that it did not look as if this happened by chance. It looked very deliberate. A friend of mine who lives near a forest area gave me this explanation. These creepers actually reach out to the adjacent trees first on the ground. Once they climb to a certain height, they tighten themselves and lift them up to the desired height. This seems plausible, but stillone question remains? Why would they lift themselves up like this? Because the probability of being destroyed is very high on the ground? Then the fundamental question remains, how do these creepers know that such a risk exists and then know what needs to be done and does it in such a brilliant way? 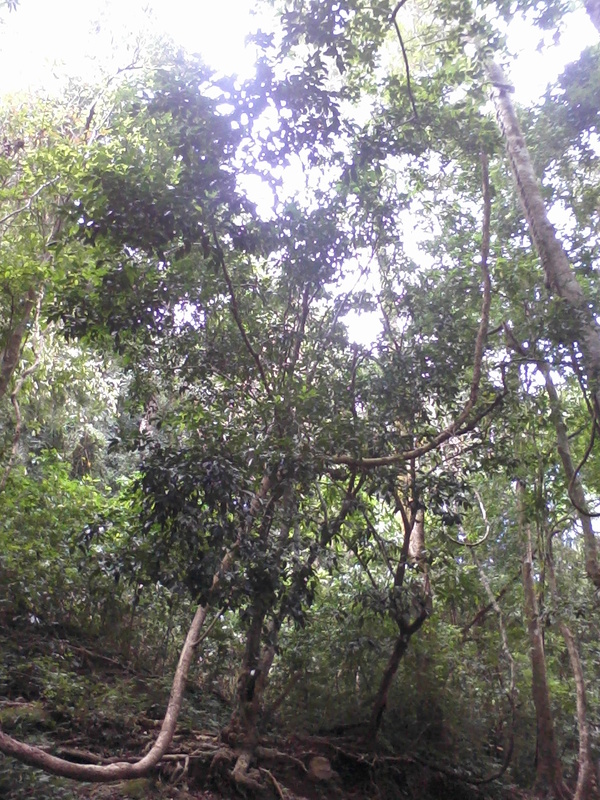 This entry was posted in Life Around, Patterns and tagged Creepers in forest, forest area, Intelligence, Intelligent creepers, Intelligent plants, Observation, Seat of Intelligence, Survival on January 8, 2012 by Sajeev. I drink water when I am thirsty. Obviously I am responding to the thirst. But if I am filling my water bottle so that I would be able to drink water whenever I am thirsty, is ‘filling the water bottle’ an action or reaction? Though at first sight it looks like an action, am I not reacting to the thought of ‘needing water’ in the future? Soon it became more and more obvious that there is actually nothing like pure ‘action’. Whatever we do is actually some sort of reaction; either to an external stimuli or to the stuff in the mind. The only difference I could think of is that there is an element of ‘choice’ that distinguishes between action and reaction. But then the choice was only influencing the quality; the basic idea of reacting still remains. Though it’s well known that most of our action are in fact reactions, it is really scary to think that we only react. Because in order to react, I need an ‘environment’ around me to react to and I need time that separate the two acts. My mind that reacts has also come in to existence as a result of reacting to the environment and time. So, if there was no environment to react to, there would be no mind, no action and no me. This means when I say I exist, that’s not completely true. It’s the environment that exist and I am just a byproduct of the reaction to it. If the environment does not exist, I too do not exist. Now shift your perspective a bit. The environment is not one entity, but is rather made of people, their thoughts, objects, events etc. Extending the same concept, each of these entities only exist because they react to their environment. For these entities I am also part of the environment. This now takes the problem to another dimension. This means that the environment also does not exist in reality; it’s also a byproduct of reacting to its environment . So everything exists through responding to everything else. Then in reality what exists? It may be far easier to imagine that we are actually ‘acting’ and not ‘reacting’ and live with that belief. It’s going to be an ‘action’ because I am going to choose it. Great me! This entry was posted in Ego, Habits, Mind, Patterns, Thinking and tagged Acting and Reacting, Action and Reaction, Awareness, Choice in action, Difference between action and reaction, Existance, Illusion, Maya, Mind, reactive mind patterns, Reality, The world as an illusion, Unconscious mind on November 23, 2011 by Sajeev. I was standing on the balcony in the 11th floor of my office building. 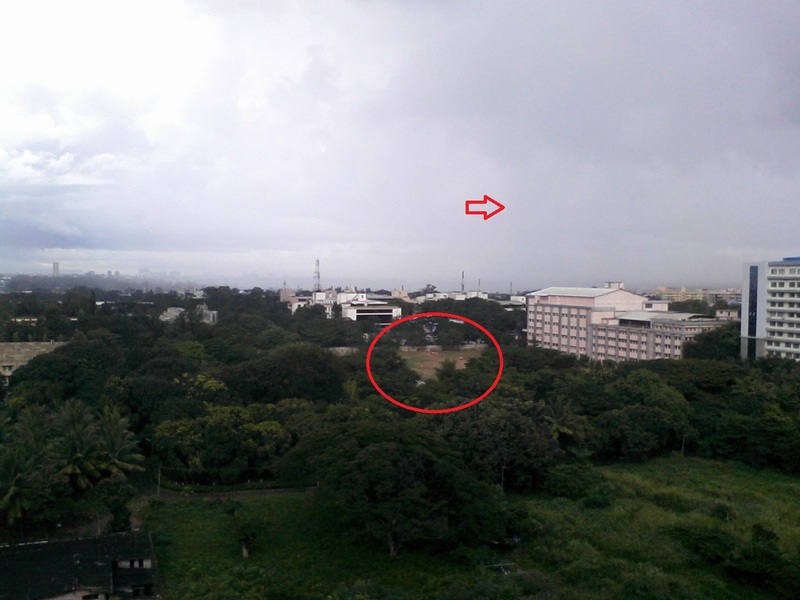 It wasn’t raining yet there, but I could see the rain advancing towards us from far off (see the red arrow in the picture). I estimated the rain to reach us in about of 10 minutes. In a moment my mind was busy with several thoughts. Rains are never welcome in Bangalore as it makes the ever chaotic traffic more messy. I was debating whether to leave quickly before the rain arrives. But then I had something to finish; would it be good idea to do it tomorrow? Or should I wait till the rain is over? What happens if the rain is going to last long? My attention was then drawn to some loud cheer from below. There were people playing football in a ground (see the red circle in the picture). They couldn’t see the rain coming and were completely involved in the game. I was disturbed, because from that height I could see the rain coming and I was already planning what to do. But the footballers, who had no idea that it was coming, were least affected. The rain arrived shortly and the footballers did what is needed to do when it rains – took shelter. And I was back to my desk and back to my work. I had to wait because I had work to finish and all that planning was of no use to me. It’s generally believed that strategic thinking, higher perspectives, ability to perceive risks in advance etc are very important qualities that make us successful and need to be cultivated. But seldom we realize that they simply take away the fun from the present moment. We are definitely capable of doing what is needed in any situation. Knowing things in advance only feeds the stupid planning mind. No wonder CJ Jung was extremely jealous when he met those native american tribes. They were extremely happy, though they had nothing in their possession. This entry was posted in Mind, Organization, Patterns, Thinking and tagged happiness, Ignorance, Living in the present moment, Mind, Planning mind, Present Moment, Rain, Risk, strategic Thinking, Thinking, Unconscious mind on November 5, 2011 by Sajeev. “What makes you think so?” I asked. “The way you both were interacting; it seemed as though he knows you well”. I am not a regular customer at the shop and was not really familiar with the shop keeper. But then I also realized that we were interacting as if we had known each other quite well. Several, probably hundreds of, people visit the shop on a daily basis. How would a shop keeper remember them? It would really be tough. But a shop keeper definitely had to remember his key customers, because they make his business flourish. So he will need to some way of figuring out who were his regular customers. When one walks in to the shop, there is a moment when the shop keeper is looking for some signs of familiarity, like a friendly smile. If that’s there, he assumes that the person is a familiar customer and then behaves as though he knew him well. He is not faking but is really genuine. So all that one needs to do is offer that first sign of familiarity nothing like a genuine smile. This was the explanation I gave my friend about this. I happened to be in a good mood that day and probably he had ‘mis-read’ my expression for familiarity. But as I was writing this post, I was thinking about it again. Will it be possible that the people we meet at the street or office also have this problem? I decided to check it out at office. I walked around the office today with a smile (as genuine as possible) and to my surprise several people I happen to meet on the corridors reciprocated with a smile, a wish or many a times with a ‘how are you’. We must have crossed each other several times in the past, ignoring. But I think unconsciously everyone is looking for that first sign of ‘familiarity’. This is perhaps an instinct built within us to differentiate between friends and enemies. But what’s also interesting is that everyone looks for that sign during an encounter. No wonder I have so many whom I do not like! This entry was posted in Life Around, Mind, Patterns, Thinking and tagged Conditioning, Familiarity, Habits, How we think, instinct, Life, Mind, Nature of Mind, Patterns, Relationships, Survival, thoughts, Transactions on September 28, 2011 by Sajeev. I recently came across two very amusing things. They happened at different times, but essentially was on the same theme. I was going through a bunch of resumes in the process of designing our expert locator system. These were the resumes people submitted to the company when they joined. There were a few resumes of the people I knew and couldn’t resist the curiosity to have a detailed look. It was really amusing. Not really because some of them have done things that you would never have imagined from him/her. But more because there was a clear disconnect between what they were and what was written in the resumes. It seemed people were trying to project an identity that they were actually not. That means if you know the person and you read his resume, there is every chance that you cannot connect them. Strangely, this does not happen the other way round. That is if you read the resume and then meet the person, you don’t feel similar disconnect. Probably because what you read in the resume sort of biases your impression. Another strange observation (I am not really sure of this) is that wherever the resumes looked very neatly laid out, I found the disconnect was more. If you ever read your own company’s job advertisement, you will almost feel that you have been going somewhere else all these days. If it was a company that you worked for some time back, there is at least the benefit of doubt that things have improved after you left. But with the current company, there is no hardly any chance. Be it an individual or an organization, what is the need to project a different identity? I remember a question recently asked on linkedin – why social networking sites are so popular? . I guess this is the reason. We want to keep telling everyone what we are. Or is it that we want to hide from everyone what we really are! This entry was posted in Habits, Mind, Patterns, Thinking and tagged False identity, Identity, Mind, Social Networking sites, Social recognition on August 30, 2011 by Sajeev. I grew up in a remote village. Our school was about 1KM away from home and all the boys and girls in the neighborhood used to walk in a group to the school. There was something interesting about these journeys. There was no fixed route to the school. The village didn’t have any roads at that time; there were just walkways. These walkways went through everyone’s property which at the time were not separated by fences. Whenever a new kid joined the school, our route would change to connect his/her house. In different seasons, we took different routes to the school. 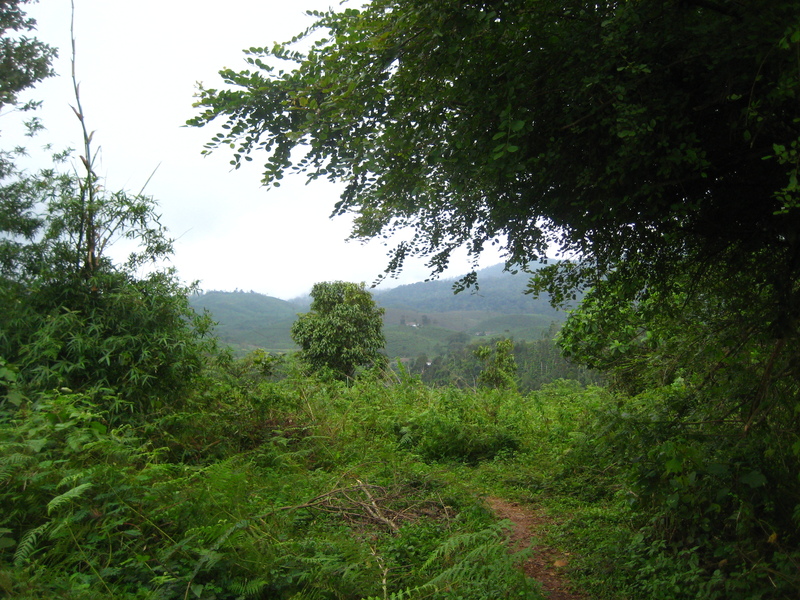 When the mangoes were ripe, the route changed to touch the mango trees. The same was true with other walkways connecting houses. If you wanted to go somewhere, you could simply walk as you wished creating a narrow trail. When used often this becomes a walkway. But it is not a permanent one. This changes as the intentions change. If I was more friendly with someone, I would have a trail leading to his house. But if the relationship turnt sour, and I found a new friend, the old trail would be abandoned and a fresh one created. The beauty was that there were no fixed paths. One simply created them based on the need and will. The thoughts came when I was reading something on ‘destiny’. Do human beings have a pre defined destiny or we create it out of our own will? Much has changed over the years. I live in the city now. Every house and property is protected with walls. The whole city is connected with a network of roads. I can go anywhere if I know the route to take. But the whole fun of creating a path on my own is gone. I drive everyday to the office through the same roads, and back. But I hardly take notice of anything on the way. They have stopped amusing me long back. This might seem a very trivial thing, but I see that it has extended to every aspect of my life. The job is defined, processes defined, daily routines defined, eating habits defined. There seems to be almost no choice. How I long to put my bare foot on the wet grass and start a small path on my own! I do not want a destiny. This entry was posted in Life Around, Mind, Patterns, Thinking and tagged Boredom, Choice, Choice in life, Destiny, Free will, Freedom, Monotonous on August 27, 2011 by Sajeev.